“I’ve found that in a lot of cases, the dam’s tail female line produces the motion in an individual, while the tail female of the sire increases the odds of getting the ‘look’. Padron is about the most beautiful thing you’ve ever laid eyes on; ideally, if you cross that horse with one with extreme motion, you get something like what happened in Anza Padron. If you then use a tail female line with a lot of athletic ability to cross on Anza Padron, you should get the motion, but maintain the prettiness. That’s what everyone wants -- a beautiful, beautiful horse that can trot”. “It’s extremely unusual in an English performance class to see an Arabian horse with so much quality and type, who looks like an Arabian horse, and can be so athletic on all four legs”. “He has so much elevation and strength from behind, with a lot of expression and an absolutely free shoulder. It’s highly unusual to see that, and obviously, that’s what we’re all breeding for. 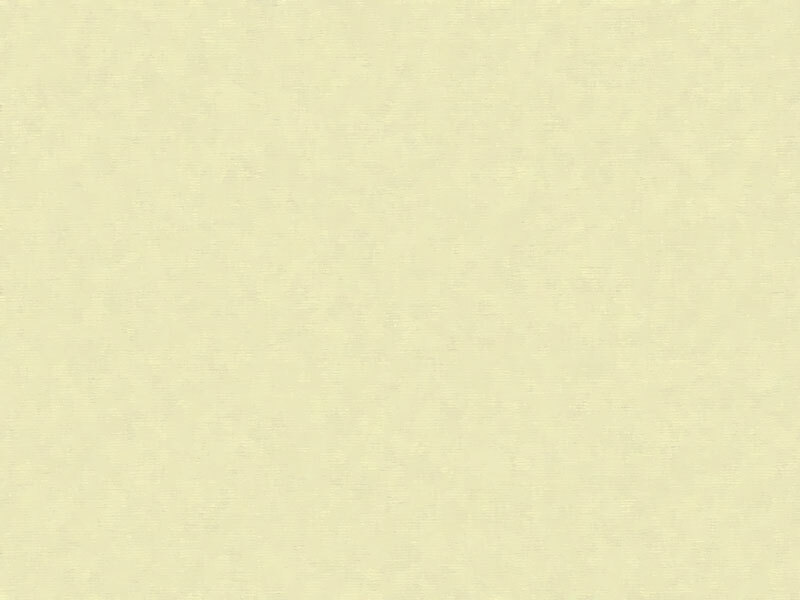 This horse has all of these qualities”. “He sits down on his hocks and gets great. Anza is making a great cross with the half-Arabians as well. Even there, they want those same set of hocks. We all know in the industry today that we need a horse with better hocks, and Anza Padron is passing that on to his offspring”. 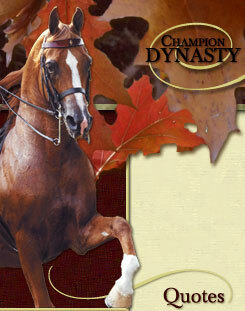 “We believe that Anza’s ability to pass on greatness comes from both his sire and his dam. We love everything about him except one thing — the ownership. We wish he were ours”. “Anza is really, really mellow and kind, but he’s all show horse. The minute you turn him loose, he ‘turns on’. He’s all about his job”. “There’s a lot of power there, but he’s generous, kind, and fun to ride. 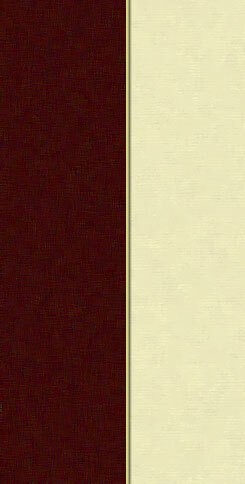 I wish everybody could have the opportunity to ride an Anza Padron”. Mike Clark, Management, Stachowski Farm, Inc.
(when he just started in training): “They turned him loose, and he was naturally gifted. He was set high in his shoulder, he moved off all four corners and he liked going forward”. "CM Little Anza Bey has taken her dad's fast trott'n action, smooth body, high set tail carriage, and sweet sassy attitude around the barn and is turning everybody's heads! This little hot-to-trot filly has elegance, beauty, and size mixed in with a Ferzon-bred Bey Shah mom. She is our new little "star" -- we are extremely happy with this combination!!" "We've been blessed not only with a truly handsome colt from Anza Padron, but also with a filly who is a full sister to our colt. Both are outstanding examples of Anza Padron qualities. 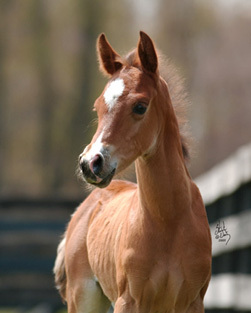 We could not be more pleased with our decision to breed our mare, EA Sterlin Doll, to Anza." in partnership with friends, making him double Padron as well. Not a bad start in life! 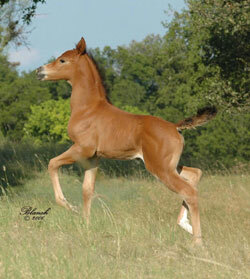 “Anzavalon (Anza Padron x Garland Afire) is the most exquisite foal I have ever seen! He is chestnut with 4 high whites and an-off center blaze — just like Anza and Padron. This colt walks around with his head straight up every where he goes. When he is outside and gets fired up that tail goes straight up along with his nose and his feet look like they are spring-loaded. Anzavalon has brought so much joy to all of our lives that I wouldn’t have thought possible. 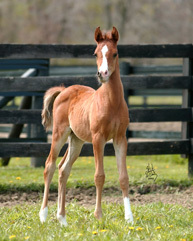 My mother would have gone totally nuts over this colt. “ I have pictures of her as a yearling and she was about as perfect as filly as you can imagine. She was real level over her top and she had an extremely long neck — and I mean long like you never saw; it was a pencil throat. Not only was she by Eter, but she went back to Bataan and some good moving Kellogg horses”.